Saving Moms Money: Sign up for E Clubs and get Free Food Coupons! Sign up for E Clubs and get Free Food Coupons! Don't have money to spend to eat out? 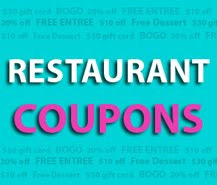 Check out the latest restaurant coupon deals going on. I will be working on an extensive list of restaurants that offer free food and coupons on a regular basis. If you have any great restaurant deals that you think people should know about please email me! Another way to score some free food is by Mystery Shopping! There are often mystery shops at high end 4 star restaurants!! Tip* Make sure you sign up for the e-clubs below a few days before you have plans to eat there. It can take several days to get your first coupon emailed! California Pizza Kitchen FREE CPKids Meal during your birthday month if you are 10 or under. Benihana Free $30 meal for your Birthday! On The Border sign up for Club Cantina (link on bottom right corner) for coupons such as Free Queso? Back Yard Burgers join the e-club for a free burger or chicken sandwich! Zios Sign up for e-club for free coupons and a Free meal on your birthday! You have great coupon codes mate, I think your coupon codes will be the best choice for my site.